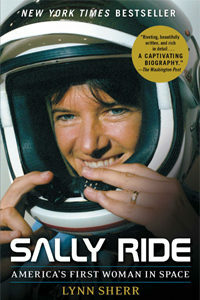 May 23, 2016 – Lynn Sherr’s book is titled: Sally Ride: America’s First Woman in Space . It includes unique insights from her friendship with the astronaut, tennis player, astrophysicist, children’s book author, and genuine American legend, as well as exclusives from Dr. Ride’s family, partner, and countless friends and colleagues. You can enjoy more from our guest @LynnSherr on Twitter, or Facebook.com/SallyRideBio. And although Dr. Ride passed away in 2012, her mission to inspire young people in science, technology, engineering, and math — and to promote STEM literacy — endures at Sally Ride Science at UC San Diego. You can visit them at SallyRideScience.com, or follow them @SallyRideSci.